Context: Ivan Nikolayich, an aspiring, young poet, witnessed the death of the head of the literary elite in Russia. It appears that Satan - disguised as a professor - caused this death. Ivan seems to have gone almost mad and has been put in a mental clinic. At half past one in the morning a man with a pointed beard and wearing a white overall entered the reception hall of a famous psychiatric clinic recently completed in the suburbs of Moscow. Three orderlies and the poet Ryukhin stood nervously watching Ivan Nikolayich as he sat on a divan. The dish-cloths that had been used to pinion Ivan Nikolayich now lay in a heap on the same divan, leaving his arms and legs free. The doctor bowed to Ryukhin but looked at Ivan Nikolayich, who was sitting completely immobile and scowling furiously. He did not even move when the doctor appeared. 'Has he been drinking heavily? ' enquired the doctor through clenched teeth. 'Hello, you quack! ' said Ivan, loudly and viciously. 'Go to hell! ' shouted Ivan rudely and turned away. 'I'm twenty-three,' said Ivan excitedly, ' and I'm going to lodge a complaint against all of you--and you in particular, you louse! ' He spat at Ryukhin. 'That you arrested me, a perfectly healthy man, and forcibly dragged me off to the madhouse! ' answered Ivan in fury. At this Ryukhin took a close look at Ivan and felt a chill down his spine : there was not a trace of insanity in the man's eyes. They had been slightly clouded at Griboyedov, but now they were as clear as before. 'Who is this incompetent Sasha? ' enquired the doctor. 'That's him, Ryukhin,' replied Ivan, jabbing a dirty finger in Ryukhin's direction, who spluttered in protest. 'A typical kulak mentality,' said Ivan Nikolayich, who obviously felt a sudden urge to attack Ryukhin. ' And what's more he's a kulak masquerading as a proletarian. Look at his mean face and compare it with all that pompous verse he writes for May Day ... all that stuff about "onwards and upwards" and "banners waving! If you could look inside him and see what he's thinking you'd be sickened! ' And Ivan Nikolayich gave a hoot of malicious laughter. Ryukhin, breathing heavily, turned red. There was only one thought in his mind--that he had nourished a serpent in his bosom, that he had tried to help someone who when it came to the pinch had treacherously rounded on him. The worst of it was that he could not answer back--one mustn't swear at a lunatic! 'Exactly why have they brought you here? ' asked the doctor, who had listened to Bezdomny's outburst with great attention. 'I had to catch the professor,' replied Ivan Nikolayich, glancing nervously round. 'Do you know Berlioz? ' asked Ivan with a meaning look. 'I see. What steps did you take to arrest this murderer?' At this point the doctor turned and threw a glance at a woman in a white overall sitting behind a desk. 'This one? ' asked the doctor, pointing to a broken candle lying on the desk beside the ikon. The orderlies stretched their hands down their trouser-seams and stared even harder at Ivan. Here the clock struck twice. 'Show him the telephone,' the doctor said to the orderlies. 'No, he's a bachelor,' replied Ryukhin, startled. Ivan suddenly roared, hurling the receiver at the wall. One spring afternoon, the Devil, trailing fire and chaos in his wake, weaves himself out of the shadows and into Moscow. 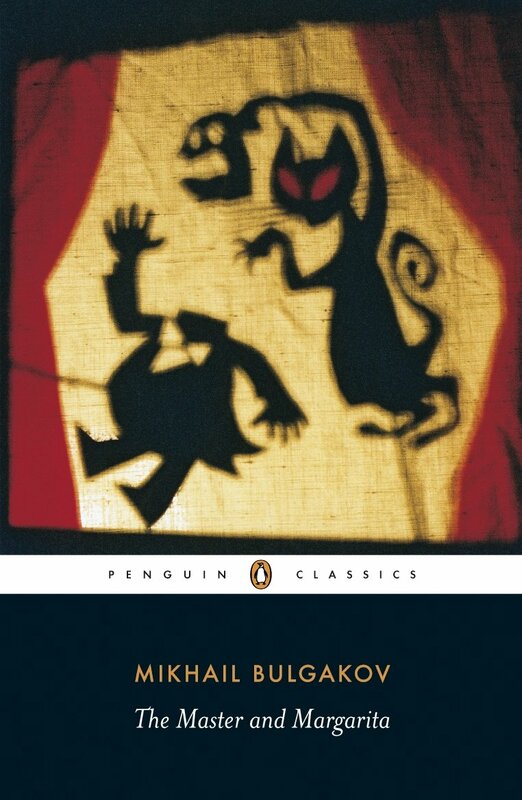 Mikhail Bulgakov's fantastical, funny, and devastating satire of Soviet life combines two distinct yet interwoven parts, one set in contemporary Moscow, the other in ancient Jerusalem, each brimming with historical, imaginary, frightful, and wonderful characters. A revolutionary book, The Master and Margarita became a literary phenomenon, signalling artistic and spiritual freedom for Russians everywhere. Sign Up for our digest and get featured snippets and new additions once a week. © Wiztrit 2019. All rights reserved.